Most people dine in fast food chains because it is convenient, cheap and offers well tasting foods. Fast foods also offer on the go meals that are beneficial to people with a fast-paced life. Children as well as adults become fanatics of fast foods because of combo meals that have one or more food choices, plus they come in very appetizing plating. The fall back of fast foods is that most of the foods they offer are not healthy. Eating just one meal can give sodium, fat and calories in excess and if you dine in fast foods regularly, you can have build-up of fats, calories and sodium which contributes to obesity. 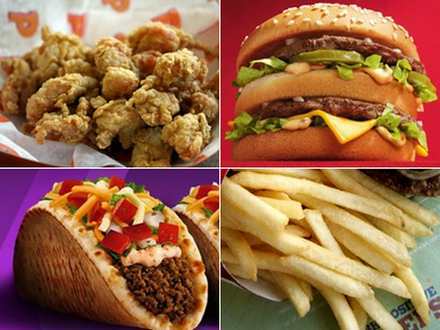 Fast foods also becomes a risk factor for certain heart diseases and diseases of the intestines. In fact, lawsuits have been made with certain fast food chains because of the incidence of obesity in children and adults. Children are also caught eating meals only that are served in fast foods, which increase obesity even at a young age. Eating in moderation becomes the solution. It is always okay to eat fast foods such as french fries from time to time, but eating every day becomes a problem. Try to dine in fast food chains only during holidays or weekends. Don’t make it as your kitchen eating your breakfast, lunch and supper there. Allow children to eat their favorites as reinforcement for their job well-done activities, but don’t allow them to eat only what they like for the rest of their lives. Teach children to eat foods prepared in the home, which is far healthier. Food choices in fast foods are not necessarily unhealthy. You can choose the ones which are healthier. Avoid fried, breaded, creamy, crispy and batter-dipped food choices. Go for vegetables and order lean meats. When ordering fried chicken for instance, remove the skin and don’t use the gravy. These components have high fat, cholesterol and calorie content, which makes you unhealthy. Instead of putting mayonnaise, you can ask for mustard or ketchup, which you can put on your own. In this way, you eat your favorite fast food, but less the unhealthy portions. Thirty two (32) ounce of soda can yield 400 calories, which is mainly the composition of what supposed to be a healthy meal. Soda, which has 400 calories plus the food you ordered will double the calorie you take in one meal. So instead of ordering sodas for drinks, choose water or juices. When you’re rushing, it leads to eating your meal unmindful. Take time to eat so you can be mindful that you have eaten a lot. When you take time eating, the tendency is, you are already full even if you have not eaten most of your meal yet. Complicated foods ted to have more food additives. You can order for a single patty burger instead of a double patty or large burger. In this way, you can cut down excessive fats and calories in your body. A single order can have as much as 1000 calories and if you super size it, you can still double the unwanted calories in your body. Order the regular meal and have a salad as a side dish instead of ordering fries. Instead of ordering two large fries, you can order one and share. Most often, servings in fast food contain more than one serving so it’s always an excess if you eat them all. You can also take some portions home so you don’t have to eat them all in one sitting. You can place a special order such as removing the dressing or some additives in your food. Instead of having a dip on your sundae, you can ask for a plain vanilla ice cream instead. Fast foods are convenient and save time, but eating most of your life in fast foods can have physical as well as psychological effects. It’s always better to choose healthy foods in order to prevent diseases such as obesity and heart problems. Resisting fast foods and choosing the better option sometimes require discipline and proper understanding of healthy foods. Fast foods include additional additives to make their food more appealing and tasty. It’s up to you if you go for these meals or choose healthier ones.